This study aims to better understand the long-term satisfaction and quality of life impact of post-mastectomy breast reconstruction and to compare implant-based (IBR) and autologous breast (ABR) reconstruction using the BREAST-Q. BREAST-Q scores in women undergoing IBR or ABR at a tertiary center were prospectively collected from 2009 - 2017. Mean scores and standard deviations (SD) were calculated for satisfaction with breast, satisfaction with outcome, psychosocial well-being, physical well-being of the chest, and sexual well-being. Reconstructive modalities were compared using regression models to control for differences in scores at postoperative years 1, 3, 5, and 7. Overall, 3,268 patients were included with 336 undergoing ABR and 2,932 undergoing IBR. The average preoperative breast satisfaction score was 61.47 (22.42), and was significantly lower in ABR patients compared to IBR patients (figure 1). Overall breast satisfaction slightly increased 1 year postoperatively and remained stable across time-points postoperatively. HRQOL domains were stable postoperatively. ABR patients had greater satisfaction scores than IBR patients at postoperative years 3, 5, and 7 (p < 0.001). IBR scores remained stable over time. CONCLUSIONS: This study demonstrates long term stable satisfaction and HRQOL following post mastectomy breast reconstruction through 8 years. 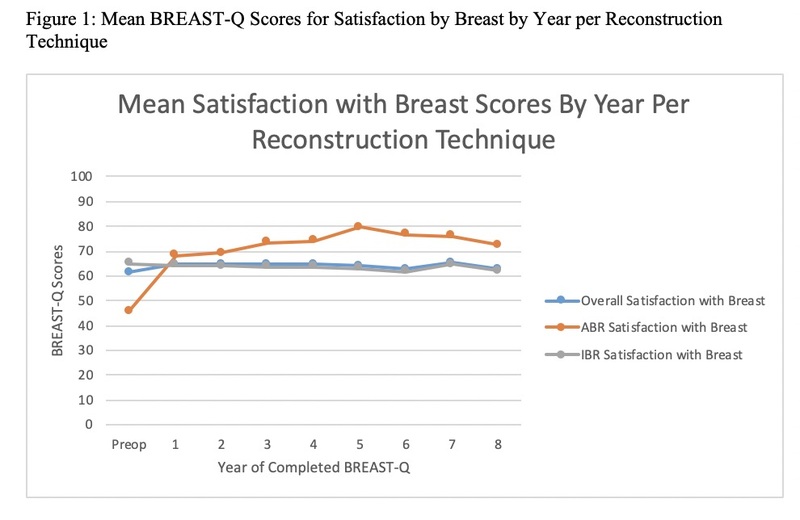 While ABR may afford higher satisfaction with breasts, although IBR remains stable over time. This contradicts the notion that IBR satisfaction scores decrease over time.